Saiz pralihat ini: 800 × 551 piksel. Leraian-leraian lain: 320 × 221 piksel | 640 × 441 piksel | 1,024 × 706 piksel | 1,280 × 882 piksel | 2,844 × 1,960 piksel. 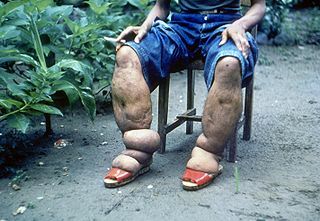 English: Elephantiasis of leg due to filariasis. Luzon, Philippines. Français : Éléphantiasis des jambes à cause de la filariose. Luçon, Philippines. This media comes from the Centers for Disease Control and Prevention's Public Health Image Library (PHIL), with identification number #373. Note: Not all PHIL images are public domain; be sure to check copyright status and credit authors and content providers.